Asian economies are entering the second half of the year bracing themselves for headwinds from all directions, from a slowing China to higher interest rates and, in some cases, political battles at home. Singapore, Hong Kong and Malaysia released bleak growth figures this month, while data from Indonesia and Thailand's forecast seem to offer no cheer as their main export market - China - suffers a demand slump and a volatile currency. The yuan's falls last week just added pressure to Asian currencies that were already depreciating amid signs that the United States Federal Reserve will raise interest rates for the first time in a decade. 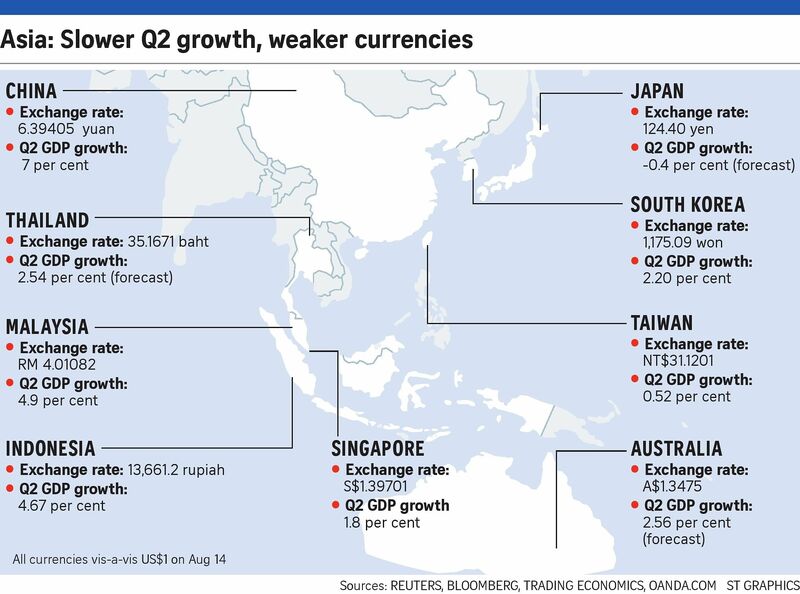 "We worry that the risk is on the downside," said Bank of America Merrill Lynch's Asean economist, Dr Chua Hak Bin. Singapore has slashed the upper end of its growth forecast for 2015 after GDP fell an annualised 4 per cent in the three months to June 30 from the previous quarter, when it grew a revised 4.1 per cent. If China's exports receive a boost over the weak yuan, there will be more demand for goods further down the supply chain. If a weaker yuan leads to weaker Asian currencies, competitiveness will be boosted. "There are more indicators to suggest that things are just as distressing as during the global financial crisis," Dr Chua told Bloomberg. Indonesia, Asean's largest economy, grew 4.67 per cent in the April-June quarter compared with a year ago - the slowest second-quarter growth recorded since 2009. Its commodity market went bust and economic reforms slowed, forcing President Joko Widodo to reshuffle the economics team in his Cabinet to reassure investors worried about a policy drift. Growth was downgraded to 5 to 5.2 per cent for this year. Hong Kong recorded a 0.4 per cent growth in the second quarter, better than forecast, on the back of increased consumer spending. But the city, whose total exports to China comprise about 25.7 per cent of GDP, fears that weak luxury spending by tourists from mainland China will hit growth. "The second half will be more difficult," said Hong Kong-based Daiwa Capital Markets economist Kevin Lai. "For Chinese tourists, Hong Kong is less attractive as retail goods are more expensive with the yuan devaluation." Economist Chang Liu from Capital Economics said the start of monetary tightening in the US and its knock-on effects for Hong Kong's housing market will create headwinds for the economy. Exporters in Malaysia and Thailand will be most vulnerable if the yuan weakens further. Even though Malaysia's economy expanded better than expected in the second quarter, it was the lowest growth in almost two years. GDP rose 4.9 per cent in the three months to June 30 from a year earlier, riding on consumer spending - before a sales tax started in April - and government expenditure. But economists are cautious about the rest of the year. "Fear of a Fed hike and capital outflows have jittered an economy with high foreign ownership of bonds and a thinning current account surplus," OCBC economist Wellian Wiranto said in a note. "Sentiment will worsen in Malaysia if the political drama (over scandal-hit state investment fund 1MDB) drags on." Oil price declines will cause a psychological impact in investors' mind, he added. Thailand, which releases second-quarter data today, is bracing itself for the weakest quarter-on-quarter growth since last year's coup, according to a Reuters poll. Falling exports, tumbling manufacturing output and subdued domestic demand are taking their toll, with data showing growth of just 0.2 per cent from the previous quarter. Some economists, however, see a silver lining amid the dark clouds. "If China's exports receive a boost over the weak yuan, there will be more demand for goods further down the supply chain," said Capital Economics analyst Daniel Martin. "If a weaker yuan leads to weaker Asian currencies, competitiveness will be boosted."